This 1925 beautiful brick home has been fully restored and converted into a cozy mountainside inn. Blending warm colors, antique oak trims and modern amenities, your stay with us is guaranteed to be an enjoyable escape from the daily grind. The Trailside Inn is just 30 minutes away from three area ski resorts, Flight 93 National Memorial, Fallingwaters, Mt. Davis and High Point Lake, Deer Valley YMCA Camp, and is located directly across from the Meyersdale GAP Trailhead. We boast a prime location for you to enjoy all of the beauty that our local bicycle trail, area ski resorts, state game lands, local attractions and mountains have to offer. Book Online or Call 814-233-1991 to make a reservation! is perfect for friends traveling together or as a kids room in conjunction with with the Nash Room. Two Twin Beds and tons of natural light make this a cozy oasis. Bathroom is adjacent to the room with a full shower and bathtub. A second floor balcony is shared with the Nicholson and Nash Rooms. Accommodates two adults or children. ​The Nicholson Room is the largest room and the Master Suite of the home. It has beautiful views from three large windows, two closets, private stairway to kitchen and a private in suite bathroom. It shares the second floor balcony with the Arnold and Nash Rooms. ​The Ringler Room is on the 3rd floor. 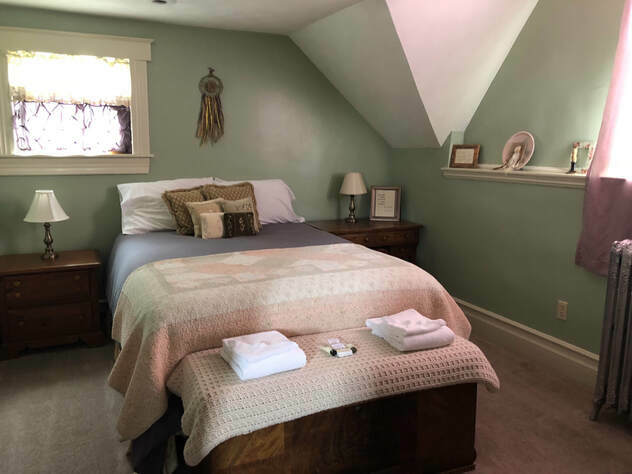 The room is equipped with a queen bed and shares a Bathroom with the Tressler Room. 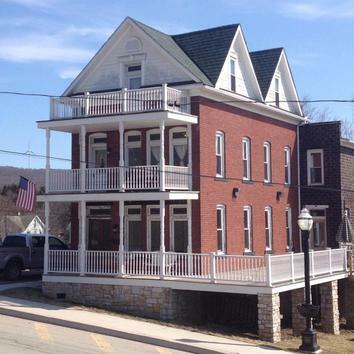 The Ringler Room offers access to the second floor balcony and third floor balcony when Tressler Room is unoccupied. Breathtaking views and maximum comfort define the Ringler Room. 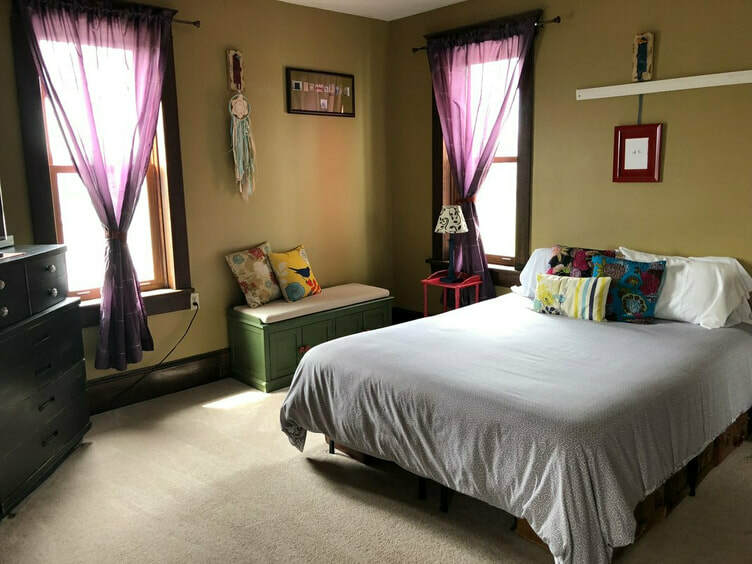 is the room with a view offering tons of cheery light and soft colors for the ultimate relaxation den. 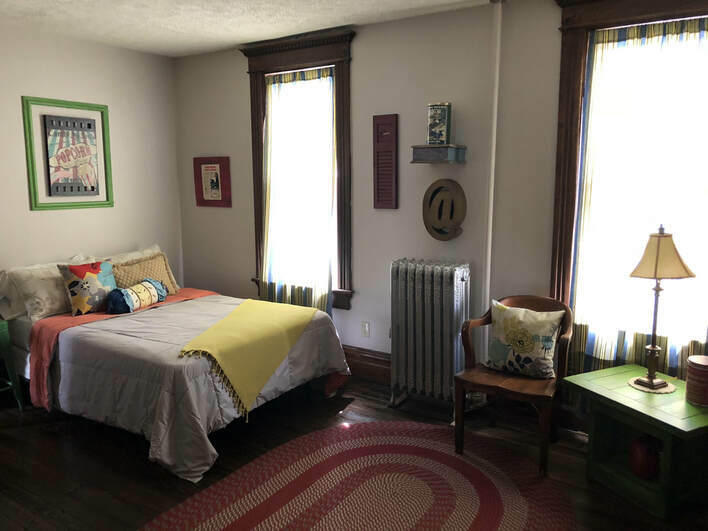 It is equipped with a full size bed and shares the adjacent bathroom with the Ringler Room. This is the only room offering a private 3rd floor balcony. Room is large enough to add an air mattress for an additional $30 charge. Room accommodates two adults / up to a maximum of four people with added air mattress. is a bright, cheery, eclectic room located on the second floor of the Inn. It boasts a queen size bed, two large windows and comfortably sleeps two adults. It shares the adjacent bathroom with Arnold Room and easily accessible. Access to the second floor balcony also available.